As the only community in the Galloway Forest Dark Sky Park we are proud of this fact and would like to celebrate our dark skies with a stargazing event. 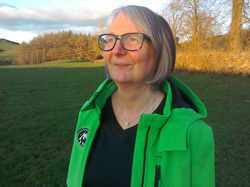 Our free British Science Week event 'Darkness and Stars at Glentrool Village' will involve stargazing followed by a chance to discuss our Dark Skies and how important they are to us. We would like to show how a community like ours can interact with others interested in Darkness Eco Tourism and keep our skies dark. 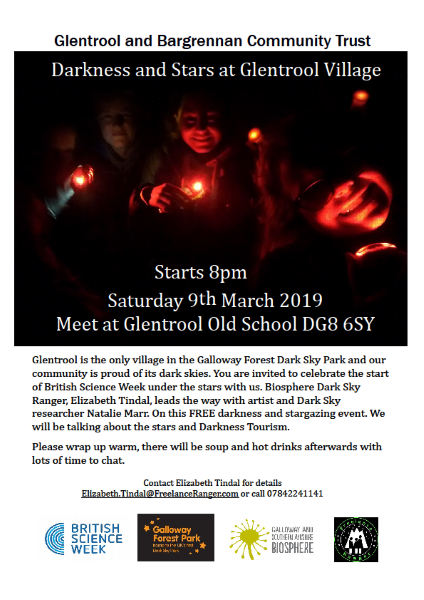 On the 9th of March we will be hosting an event where we will be working with a Glentrool community member, Hunter McCall, who is an astronomer, one of the local Biosphere Dark Sky Rangers, Elizabeth Tindal, who leads stargazing experiences and also a PhD student Natalie Marr, from University of Glasgow (School of Geographical and Earth Sciences) who is working on a project Skies Above, Earth Below: Mapping the Value of the Galloway Forest Dark Sky Park. Starting at 8pm the free BSW event will start at the Old School in the centre of Glentrool. With some initial stargazing in the village we will discuss light pollution before contrasting that by heading out to one of the darkest parts of the Galloway Forest Dark Sky Park nearby. After the stargazing we will come back in to the centre for a warm up and chat about our experience, answer questions and explore what the dark means to us. If you have any questions about the event please contact Biosphere Dark Sky Ranger, Eizabeth Tindal, on 078422411. There is no need to book for this event just join us at the Old School in Glentrool on Saturday 9th March at 8pm wrapped up warmly and ready to be outdoors.